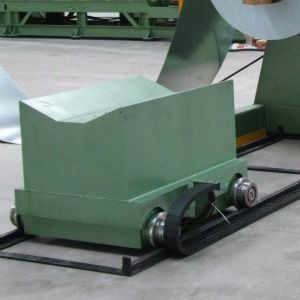 Whether for increased safety when loading, or a necessity for handling 10,000kg coils, our hydraulic coil car provides an efficient and safe method of loading a coil onto a Uncoiler. Available as a stand-alone unit or seamlessly integrated with one of our Uncoilers, allowing all operation to be controlled from the main panel on the Uncoiler. Click here to make a Coil Car enquiry.